Since the first successful procedure of a kidney transplant from a deceased donor to a living being in 1962, organ donation has been a tricky and sensitive subject. Last year Wales made history by having an opt-out donation programme, where Welsh nationals over 18 who die in the country of dragons are all considered to be donors unless they formally express that they do not want to donate their deceased body parts. Organ donation is described by the Irish Donor Network as being the greatest possible act of generosity, and with one donor’s body being capable of saving and supporting eight other lives, it is a generous gift indeed. Unfortunately few people stop to consider the fact that their mortality could add decades of time to the life of another through a conscious sign-up to the Organ Donor Network. With an opt-out system, many more lives could be saved as people who pass on leave behind their vital, life saving organs to be transplanted. While some may say it is unethical to remove organs post-mortem without express permission to do so, it is irrelevant to debate the ethics of an opt-out system vs. an opt-in one, as free choice and consent are the underlying basis of both. The difference is that everyone is considered an organ donor unless they choose not to be. If they do not believe in organ donation through religious or sentimental reasoning then they can choose to opt out. The problem with an opt-in system is that many people who would have no issue with their organs being used for better use and who would have considered being organ donors never have the opportunity to save lives with their parting from this world, and precious, necessary organs are wasted. Maybe they did not opt in through forgetfulness or lack of time. The benefits of an opt-out system far outweigh those of an opt-in system. With the opt-out system many more lives will be saved and the next of kin can feel secure in the knowledge that if their beloved departed truly did not want to be a part of the organ donation system, they would have simply opted out. 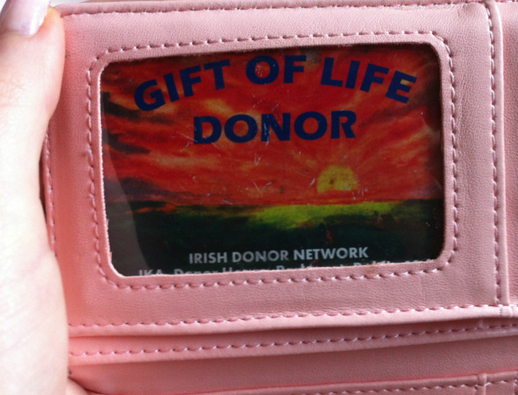 The current opt-in organ donation system in Ireland is simple and is one which gives choice to everybody. It is entirely up to you whether you decide to register to donate your organs or not. You request an organ donation card and sign it and so does your next of kin. The card should be kept in your wallet so it’s accessible. You can also sign the back of your driving license to indicate your desire to donate your organs. This is a simple and effective system in which you make a very conscious decision which you will not be able to make when it is important. If an opt-out system was implemented it removes the certainty that the donor genuinely wishes to donate their organs. Human beings are natural procrastinators and in order to prevent organ donation you must go online and unregister yourself. This could be problematic if the person died before dissenting. Not everybody reads the news or listens to the radio so if they were unaware of the new system, it might result in a donation of organs despite not wanting to. The decision would fall with the next of kin but unless there is solid proof that the deceased was against donating their organs the transplant will proceed. It is of course, impossible to receive consent from a dead person so the opt-in system ensures that those who strongly wish to donate their organs can do so, and that those who do not want to donate don’t feel compelled. Nobody likes being told what to do and if people are told that their organs fundamentally ‘belong to the state’, it could result in unpopularity. Our body is our own and we should not have a system in place where we feel almost obligated to remain an organ donor. If we are forced to actively refuse to donate our organs then it is likely we will feel ashamed and selfish which is unfair. Nobody should feel coerced into donating body parts upon their death. Furthermore, if we automatically assume that people want to donate their organs then, of course, there would be an increment in organs. With the current state of our hospitals, would it even be possible to carry out an influx of transplant surgeries or would the donated organs simply go to waste?